We had a mission for Muir Taco: Deliver fresh carne asada tacos and cold beer to unsuspecting hikers along the John Muir Trail at the Muir Hut at the top of Muir Pass. While we missed our ultimate destination goal, we had a great time in the Sierra Nevada, saw some stunning scenery, and, in the end, gave beer and/or tacos to three hikers on the JMT, all while hiking 40 miles in 40 days. The PD and I left San Diego fairly late, but it was nice, knowing we had a cabin for us waiting at Parchers Resort, near South Lake in the Bishop Creek area. We chose this, so we wouldn't have to wake up too early to get to the trailhead. We made the obligatory stop at the side of the road near the Lone Pine Visitor Center, where the sun was dropping behind Mount Whitney. Truly one of my favorite sights in the world. We ate at an Italian restaurant in Bishop (carbo-loading) and picked up some necessities at the grocery store (NyQuil geltabs) and drove the dark road to our cabin. Since it was late, we picked up our key in an envelope and got comfortable. While we were unloading the car, I got a fright when a large animal cruised up to me out of the darkness. Luckily, it was one of the friendly resident golden retrievers coming by to check us out. We sorted through our gear and got right to sleep on our respective bunks. We had plenty of room for Jeff, but his workday wouldn't allow him to leave until tomorrow. We got up at reasonable time, I was congested, but felt well due to the NyQuil and breathing strips on my nose at night. We took our final showers for a while and packed our sorted gear into the car and headed to breakfast. We spent some time chatting with the workers there, who obviously love the area they're in. Finishing our coffee, we shuffled outside to drive to the trailhead. Since Parcher's Resort was over 9,000', we were already feeling it. We made some last adjustments to our gear, chatted with a few folks just returning from their journeys, and headed up the trail. We started climbing immediately. The air smelled great. We chatted with some hikers and backpackers here and there, but they were all going to different places. We stepped aside along the trail as several pack trains made their way back to the trailhead. On our right, South Lake was frighteningly low. We were feeling the elevation, but nothing too challenging. The trail wound mostly through the trees, so we had scattered shade most of the time. After coming out through some trees, we were greeted with a view of Chocolate Peak. I had initially thought of adding a quick summit to this trip, but studying the mileage on paper, I wanted to conserve my energy for the many miles and feet of elevation gain and loss ahead of me. We stopped at the northern end of Long Lake. The weather was perfect. It was warm, but the breeze blowing off the lake was wonderful. We sat on an outcrop and didn't want to get up, ever. We moved on from Long Lake, entranced and energized by the beauty of the area. This was classic Sierra beauty, just a few miles from the trailhead. I am always on the lookout for places where I would bring my daughter, and this is one of them. There were campsites around Long Lake, which would be a reasonable distance for Soph to make. We continued to hike, up and up, past several scenic lakes. We had initially thought, like on our trip to Mount Whitney, that we might be able to make it up and over Bishop Pass on the first day, in order to save some daylight for the next day's mileage. However, our bodies, and the angle of the sun, told us that it wouldn't be a good idea. We made it to Bishop Lake, eager to have a seat on the camp chairs we had brought. We set up our tents and waited for Jeff to show. It didn't take that long. I'll probably say this many times, but Jeff is a beast on the trail. He carries a lot of weight in his pack, which makes for some great amenities, and he just cruises along the trail. I would likely crumble under that weight in a pile of whimpers and blisters. Bishop Lake sits at the bottom of Bishop Pass in a bowl surrounded by towering granite giants. It was a great setting to pitch our tents and listen to nothing in particular. The PD and Jeff decided to snooze in their tents while I walked all over the area with sandals on. My foot was still hurting from the last trip, but my stroll around the campsite turned into a scramble to the surrounding lakes. I got back to the campsite, probably overdoing it, since my foot was aching like crazy, but I really enjoyed the light and ambience of the Bishop Lakes area. The weather was still perfect and I felt like I had the place to myself. We made dinner, enjoyed each other's company, and settled in for the night. NyQuil was a champ and I slept great. In the failing light, we saw a gangly jackrabbit foraging for food. We had a nice breakfast as the sun slowly rose and shone on the mountains around us. Climbing straight up at the start of a day can be challenging, but it had to be done. 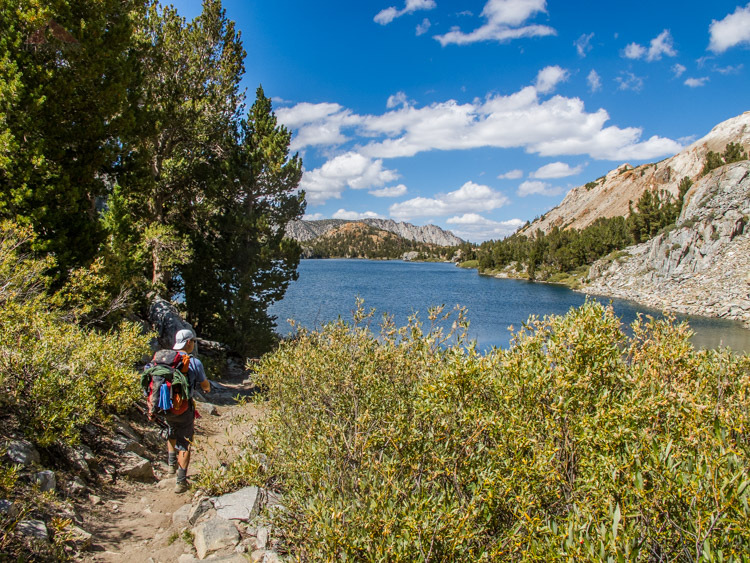 We shouldered our packs and headed up the steep side of Bishop Pass, which had the usual steep switchbacks of crumbling granite that you find in the higher elevations in the Sierra. I was regularly hacking up phlegm and my lungs felt compromised. I am not sure if it was the elevation or my cold. We made it to the top, grateful that we would be descending for most of the remainder of the day. Be careful what you wish for, it has been said. We started our way down into Dusy Basin and started encountering grass and water. We stopped by a pond and had a relaxing lunch in the shade. I put a mental checkmark in my head of special places. This was one place in which I would like to spend time. The lower part of Dusy Basin has plenty of water and plenty of likely places to find some flat ground to camp. There are meadow-like areas and it's just plain beautiful. We continued along the trail after lunch and then encountered what I like to call "The Drop Off." At The Drop Off, you can see the depth of the canyon ahead and the massive granite giants on the other side. When you look down, your knees start feeling fatigued almost immediately. But the view straight ahead is breathtaking. "We have to go all the way down there?" I may have asked that question out loud. My lungs were grateful for the break, but my knees and quads got quite the workout and my foot hurt more on the downhill portions. It was a beautiful area, with a large waterfall cascading from Dusy Branch, a massive amount of water collected from the Dusy Basin lakes. We descended past the 10,000' marker and rejoiced; we were going to have a campfire tonight. We continued to descend, reaching another steep set of switchbacks, this time accompanied by the Dusy Branch sliding down over sheer granite outcrops. My foot hurt even more. My foot, which felt better after my backpacking trip to San Gorgonio, was starting to hurt worse than ever and I still didn't know what it meant. I half-expected to hear a snapping sound any minute as the bone finally gave way. My cold was hampering my breathing. I still wasn't in prime hiking shape. The mileage and gain we had to complete on the last day was more than I expected. The mileage and gain we had to complete to deliver beer and tacos at the Muir Hut was more than I expected. With this on my mind, we hiked the remaining mile to Little Pete Meadow. On the way, we encountered a JMT hiker and offered her beer. She gladly accepted, but in retrospect we wondered how creepy we may have appeared, three unknown men offering beer to to a solo female hiker. Regardless, it was gladly accepted and we each went on our merry ways. We found a nice spot along the Middle Fork of the Kings River. And when I say nice, I mean NICE. It had a nice log on which to sit and branches to hang clothing. It had a nice fire pit to enjoy a warm fire. It was mere steps to the river, where we immediately submerged our beer and our feet. We washed up in the cold, but refreshing water. We were happy. We had made it to the spot where, per our schedule, we would spend the next two nights. After lounging in and near the river, we headed back and had a hearty dinner by the fire. We also decided that we were owed a beer tax, where we each had a beer from our stores. I forgot to mention that each of us were carrying a six-pack of beer to give to John Muir Trail hikers. Jeff was also carrying carne asada, as well as all the fixins' for delicious tacos. We enjoyed our well-deserved beer, and enjoyed each other's company beside the fire. Deer passed by our campsite, nibbling on bushes here and there. And then backpackers passed by, eyes accustomed to the failing light, eager to attain that extra mile before total darkness. While the canyon fell into dusk-like shade early in the evening, the light on Langille Peak lingered on, casting a pleasant glow onto our campsite for hours to come. We discussed the situation. I let the other two know my honest opinion about the remaining two days and my ability to complete what we had planned. The plan was to hike 7 miles to the top of Muir Pass, to the Muir Hut, and deliver tacos and beer to people who had just made it to the top. Hike 14 miles tomorrow, gaining and losing over 3,000' of elevation. High elevation. Muir Pass is nearly 12,000'. The next day, we would hike another 14 miles, gaining over 3,000', again nearly reaching 12,000' over Bishop Pass before losing another 2,000' on the way to South Lake. My assessment: I could do it, but at what cost? I had a cold and my feet were of questionable health. My gut feeling: In order to have a reasonable last day, we had to get at least partially back to Dusy Basin tomorrow. Did that mean we had to hike 16 miles tomorrow? You see, the PD and I (Jeff, too) had to drive back home on the last day of hiking. Hiking 14 miles as noted above and then driving home didn't seem reasonable to me. I felt like we were heading towards a goal that wasn't going to end well. At least for me it wasn't. I didn't want to blow the trip for everyone, so I opted to either stay at camp or hike what I could and said that the other two could continue on to Muir Pass if I could not. Jeff replied with a characteristically awesome response. He said something along the lines of, "We all make to the top or none of us will. I'm flexible, but we'll stay together. If you can't do it, you can't do it." I felt much better. He understood how I was feeling. He was there on San Gorgonio as I started developing symptoms. Again, I didn't want to throw a wrench in his plans, but I could not have planned to be in the sort of physical predicament. We decided to awaken before dawn and get an early start toward Muir Pass and play it by ear. 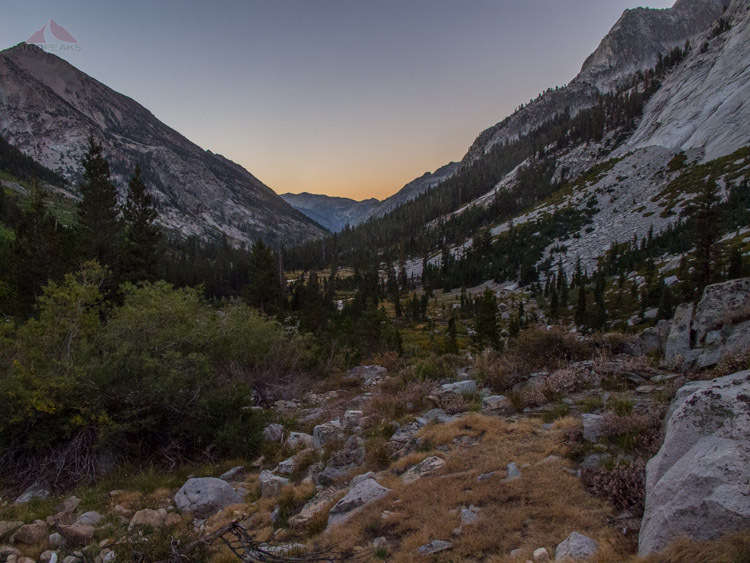 We woke up at dawn and headed up Le Conte Canyon toward Muir Pass. I was impressed with the quality of the JMT and campsites abounded. At one point, I had to use the facilities, so I hiked a short way off trail and encountered several excellent campsites that were hidden from the trail, but close to it. The sound of the Middle Fork was great as we rose higher and higher. We passed Big Pete Meadow and chatted with the campers there as deer passed by. It seems a hiker from their group had gone missing the night before. After hearing the details, we wished them luck and let them know we'd keep an eye out. Once again, I was lagging a little behind, but it always takes a bit for my body to warm up on the trail. But I could tell my cold was having an effect on me. For now, my feet were fine. We continued climbing and I continued lagging behind. I was struggling for energy and for breath, and I knew in my heart I would not make it to Muir Pass today. And for that I was sad, because I knew Jeff would never leave his hiking partners to continue on. He has goals, but isn't driven by them. "We'll work it out." He had said. We hiked along a waterfall, crossed along meadows, and saw emerald-colored lakes. It was a beautiful hike as the sun got higher in sky. We removed layers and continued climbing. But it didn't make it any easier when, at mile 5, about 2 miles short of Muir Pass, I waved at the PD and Jeff from a short distance down the trail, signaling that I was done. I couldn't climb any more, at least for now. I was gasping and spent. It was a nice spot and we saw a couple of bucks making their way down the canyon parallel to the trail. We sat there, had some snacks, and enjoyed the sun and the view of the adjacent unnamed lake. Everyone was cool about it. I was getting slower and slower. I was also determined to climb a little bit in the afternoon, shortening our hike the next day. So, after a little bit of rest, we headed back down the canyon, on the lookout for a nice spot to make tacos and distribute beer. We were on the lookout for the Muir Monster. We had missed it on the way up, but we were determined to find it now, since it seemed like a good landmark for JMT hikers. We were pretty far down the canyon, and my foot was throbbing, when we spotted it. It was an excellent campsite that was full of people in the morning when we passed it, not far from where I used the facilities. It was empty now. We took advantage of the stone seats and proximity to the river. We submerged the beer in the icy water and got the taco ingredients ready. The first JMT hiker came by. "Would you like some fresh carne asada tacos?" "Why yes! Yes, I would." The man happily joined our party and was astonished when we offered him a choice of beer. "Would you like a Hef, a Corona, or a Fat Tire variety?" We showed him the cans and he was convinced. We ate tacos with him when another hiker came along. We asked him the same questions and his surprise was palpable. I dare say we celebrated together. Of course our group had beer, as well. We all ate as much as we could, offering beer and tacos to other passing hikers, but no one else wanted to join our merry band. I soaked my feet in the river, hoping to help with the pain. We chatted about where we had been, the PD and I relaying our various adventures, while Jeff shared JMT stories, having hiked it twice. For a short time, we were all just hikers, all sharing our love for the Sierra. And beer. And tacos. After he had eaten his fill, the first hiker bid us adieu and headed up the trail. We expected the second hiker, Brice, to say the same thing when he asked, "You guys are headed out over Bishop Pass tomorrow? Do you mind if I join you?" We looked at each other. "We'd love the company." And then we were four. We let him know that we were aiming to climb part of the way up back to Bishop Pass this afternoon, to make tomorrow more reasonable and he was game. He even offered to carry some of the remaining beer, provided he could have some. We happily obliged. While reviewing my pictures of the day, I realized that I didn't take a single picture of the actual lunch we had, or the people we had met. I was too busy enjoying the moment. As it should have been. We made it back to camp, packing up our things and saying goodbye to such a great location. We headed back up the side of the canyon, gasping for breath in the heat of the early afternoon. The switchbacks leading upward were challenging. After a mile or two, we took a break on some logs. We saw a mother deer and a fawn slowly make their way through the trees. I was tired. Dead tired. But I was willing to continue to climb up to the edge of the Drop Off, to Dusy Basin, if it meant tomorrow wouldn't kill me. Jeff called it. He was done for the day. This was a place on the map marked "Campsite" and he wanted to stay here. We all breathed a sigh of relief and made camp before we hit the 10,000' line, which meant we were able to have a campfire. We spread out, went to the Dusy Branch and soaked our feet. We had dinner and enjoyed the company of deer and our new friend. As the moon rose through the trees, we talked the talk of outdoors people. We all had shared experiences, but of slightly different flavors. We talked about our loved ones back home and places we had been. We'd be home tomorrow and were excited for it, but we were content this night to share each other's company and experiences. We had some beer and dinner and probably stayed up later than we should have. But we had a great time. We did the usual: Got up, had breakfast, which included the newer Vanilla Latte Via, which is a great addition to my backpacking must-haves. There's not many things better than having great-tasting coffee in the morning. I did an inventory of my food and realized that I was getting pretty low. But then I figured I should be getting back to the car not too late today, so it should work out just fine. In the morning, I would hack up all sorts of stuff, but the NyQuil and breathing strips on my nose really helped me get a solid night's sleep. We were happy to not be carrying beer. We headed up the trail, back to the remaining switchbacks before the Drop Off. It was cool in the shade, but the sun warmed us up on one side of the switchbacks. After passing the Dusy Branch waterfall, I was lagging behind when I reached the edge of the Drop Off. I turned around and looked back to where I had hiked up. This is one of the truly great views of the Sierra. So much that I included the panoramic photo I took twice in this post. It was truly stunning. Here's a larger Flickr verson of the iPhone pano. We took a short break at the top, grateful for some rest and that some of the steepest climbing was done for the day. And the trip. We still had to make it to Bishop Pass, but we recalled that it wasn't that steep. However, after the mostly level lower portion of Dusy Basin, we still encountered quite a bit of gain on the second half. After all the mileage and gain(including the San Gorgonio trip), my cold, and my aching foot, I was plain tired. To anyone who has ever hiked in higher elevation, you know the drill. Take 20 steps or so and stop to catch your breath and let your heart rate become again more reasonable. This is how it was for us on the way back up Dusy Basin to Bishop Pass. The clouds were coming in and we were often stuck between a chilling breeze and an oven-like sun. Looking at the clouds accumulating to the south, I hoped we would exit the wilderness before any downpours. We made it to Bishop Pass and congratulated each other. The major uphill battle was done. The rest was downhill. We headed down the steep switchbacks on the north side of the pass and again were treated with excellent views of the drainage. My foot was screaming as it had to navigate the moving, uneven, and rocky trail, and we still had many miles to go. The pain in my foot was offset by getting reacquainted with the beauty of the lakes as we zoomed by. I asked the PD to take a break. I needed to rest my foot and my body. We both agreed this wasn't a mad race back to the car. We chatted with some gentlemen on the trail and it turns out that they were from San Diego, as well. They were actually from Escondido, near to where I am opening a burger restaurant. We chatted about burgers and told him to come by in the spring with a special password we discussed to get a free burger. It was enjoyable and something we would have missed had we not stopped to take a break. We picked up our packs and moved on. The miles flew by as our bodies grew tired. Any uphill we encountered slammed our progress to a slow crawl. My foot couldn't get any louder, so I just ignored it. Any slight variation from flat and it howled. Any minor tap on the front toe rubber and it let me know it didn't like it by sending a lightning bolt of pain through my entire foot. Every step was a challenge. A visit to the podiatrist and an X-ray was in my future. After tons of downhill (way too much), we made it back to the car. I immediately changed out my shoes and clothes. We all high fived and shared contact info with Brice. He had to meet family right away, so, after Jeff dropped him off at his hotel, we met at Burger Barn and enjoyed a fresh and hearty meal. Once again, the PD and I had our summer adventure, sharing our experiences. This time, we had, Jeff, too. And it was a great time. Kudos to him for having such a great idea. It may not have ended up exactly as planned, but we brought some joy and surprise to several JMT hikers. The expressions on their faces were worth all the effort that it took. I got introduced to a new area in the Sierra and I will definitely be going back here. After I get my foot checked out.